This Act may be cited as the "First Amendment Enhancement Act of 2019". All elected and appointed officials of the legislative and executive branches of the State of San Andreas should serve the needs of all citizens equally. All elected and appointed officials of the legislative and executive branches of the State of San Andreas should perform their duties with impartiality, fairness and integrity. 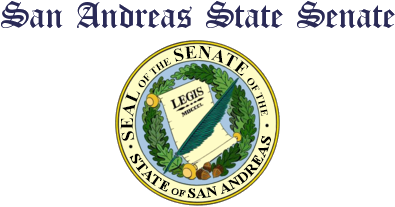 Members of the public should be made aware of the efforts of lobbyists and lobbying organizations to influence legislative actions of the legislative and executives branches of the State of San Andreas to ensure the impartiality, fairness and integrity of elected and appointed officials. "Agency" means any State or local government agency. "Campaign donation" means a financial contribution made to a politician or a political campaign or a political party. "Candidate" means any person seeking nomination or election to any State or local elective or appointed position, including, but not limited to, incumbent officeholders running for re-election. "Elected officer" means any person who holds an elective position or has been elected to an elective position but has not yet taken office. "Elected officer" also means any person who has been appointed to fill a vacant elective position, including, but not limited to, a seat in the Legislature. "Election Cycle" refers to the period beginning the day after the previous general election for a given state office and ending on the date of the general election for that office. “Legislative action” means the drafting, introduction, consideration, modification, approval or defeat of any bill, resolution, amendment, nomination or other matter by the legislative and executive branches of the government of the State of San Andreas or any committee, subcommittee or select committee thereof, or by a member of the legislative and executive branches of the government of the State of San Andreas acting in their official capacity. “Legislative action” also means the action of the Governor in approving or vetoing any bill. "Lobbying organizations" means any business organization or individual lobbyist that receives financial or other compensation to influence legislative action on behalf of any other person or organization. "Lobbyist" means any person who is employed to communicate directly or through any other person with any elective official of the legislative or executive branches of the government of the State of San Andreas to influence legislative action. "Influencing legislative action" means promoting, supporting, influencing, modifying, opposing or delaying any legislative action by any means. The San Andreas Lobbying Disclosure Database shall be a database of individual lobbyists and lobbying organizations, maintained by the State of San Andreas and managed and operated by the State Clerk of of San Andreas. 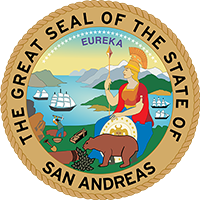 The San Andreas Lobbying Disclosure Database shall have an online version maintained by the State Clerk of San Andreas accessible to the public. The San Andreas Lobbying Disclosure Database shall be regularly updated by the State Clerk of San Andreas. All individual lobbyists shall register with the State Clerk. All individual lobbyists shall be registered with the State Clerk prior to beginning lobbying activities including, but not limited to, being employed by a lobbying organizations. All individual lobbyists shall promptly notify the State Clerk of any amendments to be made to their registration. All individual lobbyists shall file their registration form and any amendment forms under the penalty of perjury. Any individual lobbyist who knowingly provides false information in their registration form or amendment form shall be be charged with P.C. (4)08. Perjury. There is established a register of lobbying organizations to be maintained by the State Clerk. The register shall be available to the public for consultation and shall be updated regularly by the State Clerk. All lobbying organizations shall register with the State Clerk. All lobbying organizations shall promptly notify the State Clerk of any amendments to be made to their registration. All lobbying organizations shall file their registration form and any amendment forms under the penalty of perjury. Any employee of a lobbying organizations who knowingly provides false information in their registration form or amendment form shall be be charged with P.C. (4)08. Perjury. All financial contributions made or delivered by an individual lobbyist, lobbying organizations or employee of a lobbying organizations to an elected officer or candidate or a political action committee connected to an elected officer or candidate shall be reported to the State Clerk within twenty-four (24) hours of the contribution being made. All financial contributions made or delivered by an individual lobbyist, lobbying organizations or employee of a lobbying organizations to an elected officer or candidate or a political action committee connected to an elected officer or candidate shall be published in the San Andreas Lobbying Disclosure Database. All reports of lobbying activities shall be filed under the penalty of perjury. Any individual lobbyist or employee of a lobbying organizations who knowingly provides false information in their lobbying activities report shall be be charged with P.C. (4)08. Perjury. Candidates must maintain financial records for their campaign and provide them immediately if demanded by the Bureau of Elections. The financial records must show any outgoing or ingoing transactions, with names of persons or organizations, as well as a date stamp. Political parties, political action committees, and businesses other organizations are able to make donations to campaigns. Candidates may only accept a maximum of $250,000 per donation by a citizen or a business per election cycle. Candidates may only accept a maximum of $1,000,000 per donation by a political party or political action committee organization per election cycle. Candidates must not make promises to provide services or votes in exchange for donations. Candidates and political parties may not pay a sum of money to anyone or another organization/agency, that may influence the vote. Candidates may use funds to pay for campaign expenditures advertisements. Upon the passing of this bill, this act shall repel any other legislation which infringes upon its stipulations.